Remember how amazing it was to have a fort when you were a kid? Was it the central hub of your group of friends? Almost every child enjoys a fort. A fort provides a secret hideout, a sense of adventure, and a place that only close friends are invited to share. A fort can be as basic as a sheet spread out over a group of chairs or a more elaborate structure. Gift your child an outdoor fort playhouse and watch their imagination soar. Your child is sure to develop a superior sense of adventure and have hours of fun. Depending on your budget, space availability, and time available, you can design an elaborate fort and a simple one. However, the fort must have a few basic features. A fort should ideally not be a very large room. A small space, enough for your child and a couple of friends is just the right size. You can build a small room and ensure it has a door and few windows. Maybe a moat with a bridge will enhance the authenticity of the fort. Your fort could also have a small turret or tower if you are building more than a single story structure. To make the fort authentic provide some appropriate décor. You and your child could create a flag that can be draped on one wall, install pictures of weapons, and so on. Apart from this, you should also add basic furniture such as a chair, table, rug, and some lights. To maximize space utilization, ensure that the furniture can do double duty. For instance, a trunk or chest can be used to store stuff while also providing a seating or surface space. Make sure that the furniture, and any outdoor structure for that matter, can handle the rigors of Mother Nature. Make sure there is some insect repellant in the fort or spray all around there before you want to out hang out in the fort. If you do not like insects, then perhaps you only need to hang out in the fort in the winter. Make sure there is no rough housing since someone can get a splinter and that could wear out the fort even quicker. If you have a tree or some shrubs close to the fort site, you can also consider installing a secret opening. This could be concealed behind the tree or shrub, and require your child to crawl or stoop to enter the room. Make the opening smaller than for adults to ensure your child feels it is more exclusive to them. A well-lighted fort is more like a playhouse. Instead, provide shutters and low lights including glow sticks to ensure that the fort can be converted into a place of mystery and secrets. It is possible to build a fort using pallets or pieces of timber. All you need is a flat surface and timber for walls, floor, and roof. Another idea would be to purchase a basic playhouse and redecorate it to convert it into a fort. Playhouse Kits or From Scratch? Begin by laying one or two pallets on the ground to provide a level surface for the floor. Next, check if the other pallets you have fit around the floor to form walls. Once you have tested that the pallets are the right dimensions, you can fix them to the base pallets using screws. Use OSB sheets for the floor. As pallets can have splinters (as already mentioned), use sandpaper to thoroughly remove all splinters from the pallets and make them smooth for little hands. You can place a couple of pallets over the walls to for the support structure for the roof and use galvanized sheets to ensure that the roof is water proof. If the walls of the pallet fort are too low, you can place 2x4s along the sides of the room and place the wall pallets on them. Finally, if you want to provide more privacy to the fort, simply fix a few sheets of OSB at intervals along the walls. You can add tiles or rugs to the floor to ensure that the pallet fort is comfortable and cozy. Whether your child wants a fort to ensure their privacy as he or she reads and dreams or wants to imagine more adventurous games, a fort playhouse is an ideal gift for a kid. Another advantage with a fort playhouse is that you do not need to spend a lot of time decorating it with curtains and pictures. Instead, a fort by definition is expected to be basic, providing a sturdy structure for your child to call their own without the trappings of their room. The few furniture and accessories will leave your child with plenty of space to improvise and innovate, unleashing their creative side. Their imagination is really the guide here. 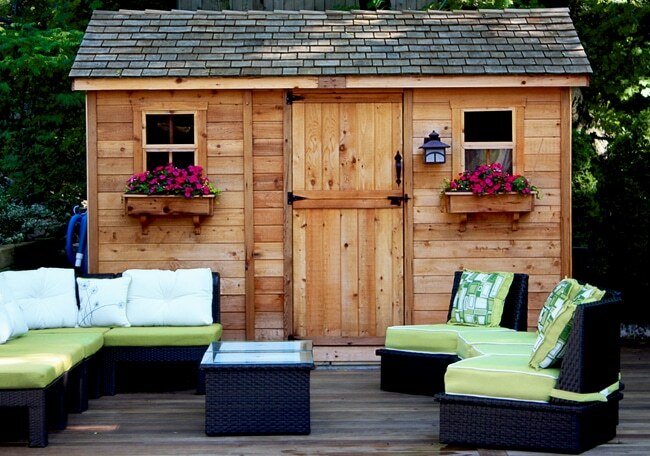 Situate the fort playhouse in your backyard and provide some additional privacy by planting shrubs or plants in front of it. As your child grows older and wants to enjoy time on their own, you will be able to provide the space they need while still ensuring that they spend time outdoors. Building a fort playhouse can be an incredible activity for parents and children to do together and the child will have the satisfaction of acquiring their own personal space.